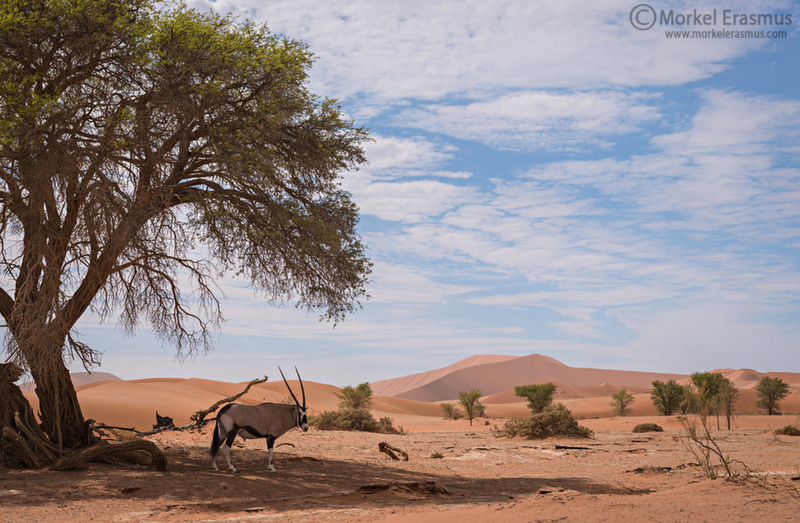 A lone gemsbok (oryx) seeks shelter against the sweltering sun mid-morning in the shade of a camelthorn tree, taken in the Namib desert near Sossusvlei and Dead Vlei. Nice animalscape, showing off those amazing dunes! Good idea to add the polarizer for the harsh light of the midday hours. My only slight observation is that dead branch that rises up over the rump and back of the gemsbok, it catches my eye each time I look at the sheltering animal. A shame, as I love the image and the story it tells of the survival techniques of the creatures that live in this harsh environment, Morkel. Great composition and beautifully done with the wider view. Really nice story-telling image-I can almost feel the heat in those desert sands. Makes me wonder how these animals survive in such a hostile climate. Well done! Love the framing here with wonderful contrasting sky and desert colours, with just enough shadow detail, nicely seen mate.